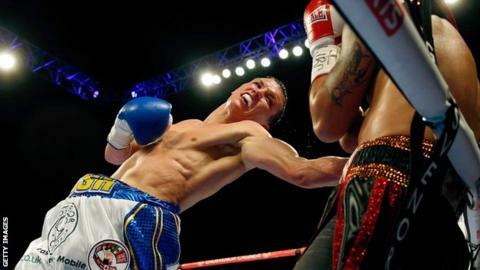 Josh Warrington has rekindled his spat with IBF world featherweight champion Lee Selby over their proposed bout. Warrington says he is "bored," of Selby, who he believes could lose his world title in his mandatory defence against American Eric Hunter. Warrington defends his WBC International Featherweight title against Hisashi Amagasa at the First Direct Arena in Leeds on April 16. "I really want the Selby fight, but it's boring me now," said Warrington. Warrington has been linked with a summer contest against Selby, most likely to be at Leeds United's Elland Road ground. Selby last fought in America on 15 October when he retained his title by beating Fernando Montiel in a scrappy contest having become Wales' 12th world champion by beating Evgeny Gradovich. No date has been set for Selby's clash with Hunter, but it could be an undercard fight on the 9 April bill at London's O2 Arena, headlined by Anthony Joshua fighting for a world title. "There's a real chance Selby against Hunter could feature," said promoter Eddie Hearn. "Over the next week or so we've got to decide who goes where, and make sure we've got a really strong undercard and some big names on 9 April for a support act to for the main event." Warrington feels Selby has been below his best since capturing the world title in May, 2015. "Before he went to America to fight Montiel he wanted to crack the States and wasn't interested in me, but he boxed poorly against Montiel and now he is saying he will come to Leeds and chin me," Warrington said about his rival. "It's becoming boring now. Hunter is a dangerous fight and if he (Selby) boxes like he did against Montiel he'll lose his belt. "So let's keep winning, everyone wants the fight and it'd be a big occasion in Leeds."